Rolly Larmour was recently recognized for his tireless support of the residents of Fairview Manor. 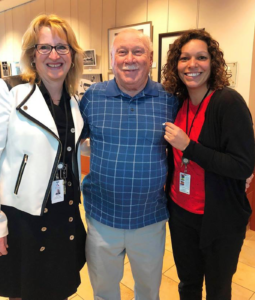 He was awarded a Guardian Angel Pin by Karen Buness, Director of Care, and Joyce Rolph, Interim VP Patient/Resident Services and Chief Nursing Executive. The special Pin was, in part, to thank Rolly for the generous donation of a fence in the Maple Grove courtyard. The fence has increased the safety of the courtyard so now residents are able to roam freely and enjoy the gardens and nice weather. They also wanted to recognize him for all the other things he does such as helping to porter residents to events, serving snacks, talking with residents and whatever he can to help brighten their day. Thanks Rolly for being a Guardian Angel for our residents.